After the mild disappointment of my trip to see The Wizard of Oz on Saturday, yesterday was the turn of West Side Story at Sadler’s Wells, which made up for any lingering disappointment. I’m not going to write too much about West Side Story, as I’m not sure I can do justice to either the show, or the production itself. There has also been a lot written about it, given that this year marks the show’s 50th anniversary. If you are interested, I plan to do a bit of a round-up of the articles and reviews later this week (but if you can’t wait until then, check out the Guardian editorial or a Times article. But first, what did I think about the show? Coming to a West End theatre near you? Back in March, when this blog was still just days old, I wrote a post entitled ‘Upcoming shows – why musical theatre fans should be excited’ in which I talked about 4 shows rumoured to be coming to London that I was looking forward to. One of the shows, Spring Awakening, has since announced that it will be opening at the Lyric Hammersmith. Over recent weeks, the number of new shows either being rumoured, or announced, seems to have accelerated. I thought it was worth providing a round-up of rumours, to give you a sense of what you can expect to see arriving in London over the next 6-12 months. Via an advert on that website, I’ve discovered another site that complements CastAlbums perfectly – ArkivSong.com. It’s an American website where you can buy soundtracks, including ones that you’d struggle to find on Amazon! Song choices in I’d Do Anything – what musicals do they come from? As I mentioned in my post on this week’s ‘I’d Do Anything’, this week marked the first individual performances of songs from musicals. Given it was the 3rd week of live shows, it’s about time too! I recently discovered a fantastic website, and wanted to share it with you. If you love musical theatre, then this really is an invaluable resource. 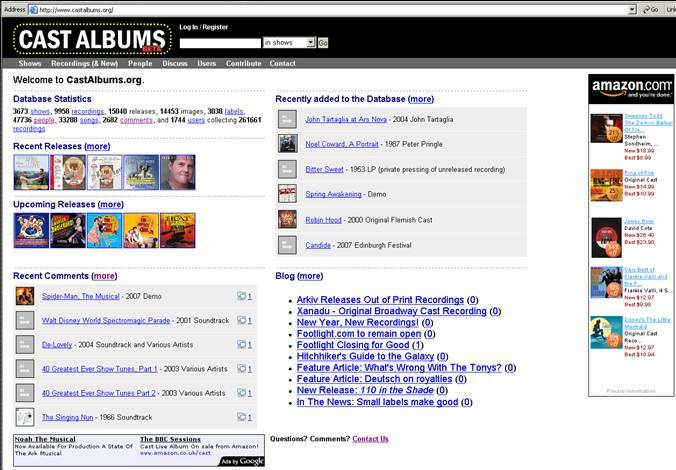 As the name suggests, CastAlbums.org is a searchable database of audio and video recordings, but it really is so much more than that. It combines aspects of an online shop, database and community – just think of a musical theatre-themed combination of amazon, imdb and myspace. The thing that struck me initially was the sheer volume of data included – the database already includes more than 3000 shows, 30,000 songs, and close to 50,000 people. It includes both official cast recordings and non-commercial recordings like demos and live recordings. Perhaps most importantly, I really trust the data as it has been built up by people who know and care about musical theatre – the site’s ‘users’, which currently number ~1700.